When I get into the mode of recreating backgrounds for a particular movie, it can border on obsession. Such was the case with this ALICE B/G. Why? Well, it becomes a matter of getting at the background art, no matter how difficult. I'll bet no one at Disney ever envisioned a day when technology would allow dis-assembling the films one frame at a time. I almost gave up on this one. The Tiger Lily and Dandy-lion sway all over the screen, making it a tremendous challenge to eliminate the animation and get to the background art. But as I watched the "Golden Afternoon" sequence, I was struck by how reminiscent this particular B/G was of the background art in the "Waltz Of The Flowers" segment in FANTASIA. So I hammered away, one little section at a time. And by George, I succeeded! So... here it is. There are several things I love about this piece. 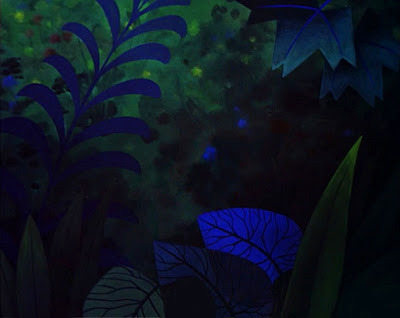 There's the extraordinary Mary Blair color styling, which is very subtle here but still a "wow." And I love the "dabs of color" that add such wonderful texture to the "background within a background." All this could well go unnoticed in the mere 4-5 seconds it's on screen. It's obscured by the lively animation. And, it's over just as soon as it gets started! But, now, here it is, re-created, and we can savor each and every lovely detail.